Colorful and handmade products have always been my weak point. Now when I am shifting the house and don’t have enough space to keep all the pretty little handmade products I realize my mom and I have been rampantly buying I realized I hat to put a stop to this. Before dad would realize where all the money from his account vanished. She is disappointed with my reluctance but heartbroken because she feels I have lost interest. She has every item stocked in her brimming show case and proudly shows it to evey guest with each item having its own story and at the end of the drama she looks at me with her puppy eyes making me feel guilty for doing that but, I wanted to use stuff and she wanted to keep it in the show case, even my handcrafted diary from Jaipur! Our every trip followed with load of souvenirs and handmade items that help us reminisce the beautiful family time and fun we had. My mum has become selective because of lack of space and now she is in love with my prized possession by The Rangroute. Rangroute re-kindled my love for beautiful handmade diaries. 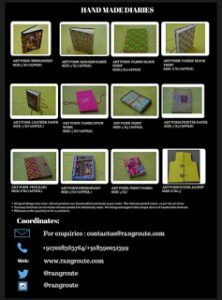 They have beautiful tea coasters, diaries, photo frames pen stands and many more that you got to discover by taking the Rangroute way. 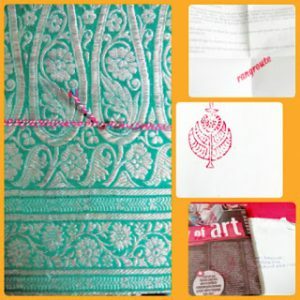 The green banarsi saree covered diary is my favorite and my mom has made all her plans of using the leaves of the beautiful diary and the bet is the one who decides the best use gets to use it. Well, what else could be better than jotting down my daily musings. Evernote for it she says! My eyes are now on the lovely pen stand that would be perfect for my study table. Because I know my diary is a lost bet. If you are a lover of authentic handmade products and want to experience the desiness of beautiful cities of India, take the Rangroute! They are good, efficient and lovely people. Responsive to pings and tweets.